He makes Ted Cruz look like an honorable and decent person. Let’s point out, again, everything horrible here. 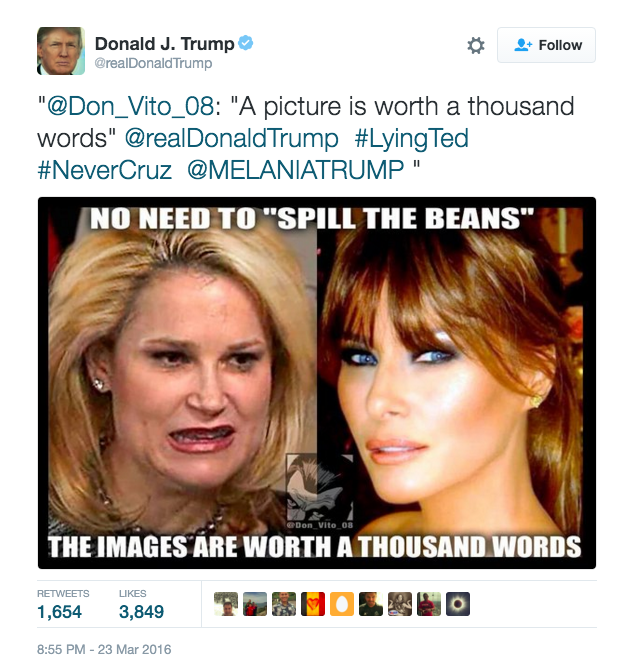 The Republican frontrunner is attacking his rival’s wife, based on her personal appearance, on Twitter, his desired forum for discourse. The attack comes in the form of a reweet from someone who has named himself “Don Vito 08”, which is perfect image of a Trump supporter- sad and lost but with delusions of greatness underscored by violence. Again, he makes Ted Cruz- who is Richard Nixon without the charm, personal magnetism, or higher sense of ethics- look like the big man here, with the moral high ground. None of this matters, of course. Trump is beloved because of his vulgarity. Because he sleeps with women who look like Melania despite being the human incarnation of lung cancer. Because he swaggers like a caricature, like someone playing Vito Corleone in a low-rent Godfather knockoff in the worst community theater in Secaucus. Just remember that he is the frontrunner. The plane has crashed into the mountain.